HomoCys can be remethylated to Met in the reaction catalysed by either Met synthase or betaine HomoCys methyltransferase. 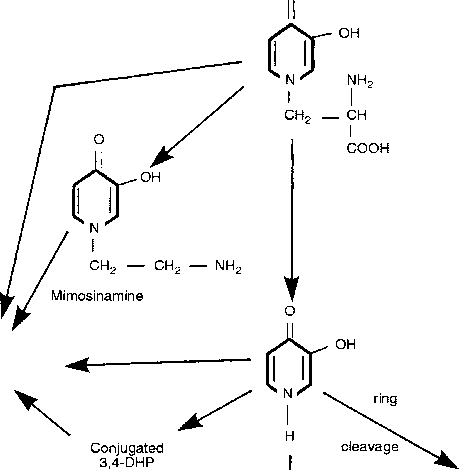 The for mer reaction uses methyl-tetrahydrofolate as a methyl donor and the latter requires betaine and its analogues (Stipanuk, 1986). About half of the HomoCys is consumed in remethylation and the rest diverted to transsulphura-tion in humans, intact rats, perfused rat liver and the incubated liver homogenate from rats (reviewed by Stipanuk, 1986). Remethylation conserves Met, so a change in remethylation may result in a change in Met availability for protein synthesis or for Cys synthesis. For example, remethylation was depressed by 23% when Suffolk cross wethers were infused with choline bitartate (0.5 g day-1 choline equivalent) plus 1 g day-1 creatine for 8 days, whereas Met flux (based on infused [U-13C]Met kinetics in whole blood) was reduced by 15% and wool growth rate (fibre length and volume) tended to be reduced (Lobley et al., 1996a). The amount of recycling of Met from HomoCys accounted for 0.33-0.38 of the Met flux (5.72 g day-1), compared with the estimated Met absorption of 2 g day-1 (Lobley et al., 1996b) which also accounted for about 0.35 of the Met flux. It seems that the provision of methyl donors reduces transmethylation of S-adenosylmethionine or diverts Met to the other catabolic pathways rather than the transsulphuration pathway. The reduced availabilities of Met and possibly Cys in the body and probably also in the skin would have a major influence on wool growth.